I loved the vibrancy of the Decoart mister and the cool effects I got, once dried I edged with walnut stain distress ink and stamped some of Andy Skinners new crackle stamp using titan buff paint...in random places . Then I stencilled through have your say stencil , using walnut stain distress ink...just some of the numbers in random places.. to complete the base layer of my piece. I added some rusty trellis, using Tim Holtz die , rusted using timeworn technique from Andy Skinners online workshop...I know again...but I cannot stop making this stuff! 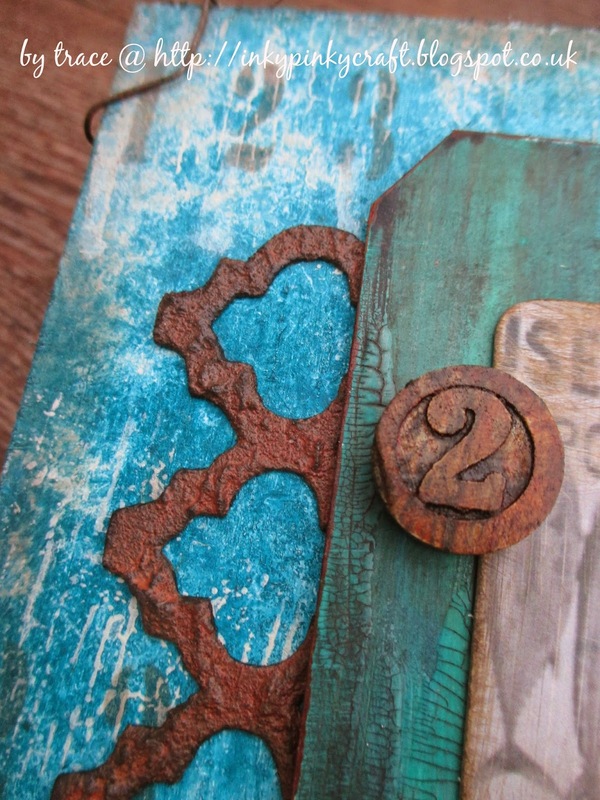 I love the rusty colours against the turquoise.... and this made my next layers.. 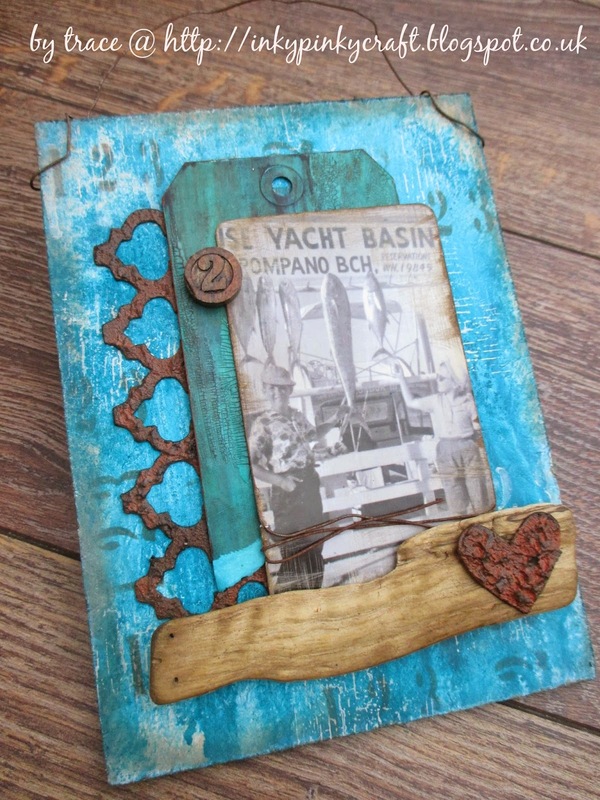 I added a rusty heart using new Tim heart die and same rusty technique...added to some driftwood..
and some rusty wire to create a hanger for this piece..
Well I hope you like my Decoart and distressing playtime...I loved it! All the details from the master himself can be found here , I followed the idea of the tag and loved the collage feel...a new found favourite of mine...I have made a few pieces lately and realised , I haven't even stamped! shock horror! I added a number plaque which I had added some Decoart paint washes too...and some distress paints too.. and created a heart , covered in tissue tape, paints and crackle glaze, topped off with some rusty wire...a girl can never have enough rusty wire! I added the arrow as Tim had done with the heart charm, but added it on some more rusty wire. Some dyed seam binding tied at the top of the tag, love all those crinkles! The word band was added the same as Tim had done...but it had some painty washes first. I added it on rusty wire and stapled to the tag . Finally a close up of the heart and as you can see I splattered my background using my splatter brush and white paint. i just love the effect it gives. I loved playing along again this month and cannot wait for the next one.....I will be linking my tag up to Tim's tags here . keep those fingers inky ... and painty! I know I am being a bit of a sporadic blogger but I am playing and enjoying dabbling in the crafty world again and enjoying the whole ...playing thing, that sometimes get lost in deadlines and everyday life...some days I play with crafty things and some days I don't , no pressure but plenty of fun! So do you ever feel like you have found a way back to something that you loved, lost in life's ups and downs and now have found again....I feel like I am discovering all the things I loved about crafting and had forgotten ....the gorgeous way that crackles appear and how they look when inked, the yummy way simple drops of water splashing on distress in make so much magic...I know what a soppy socks, but I really feel I am experiencing the joy of crafting all over again ....and I don't want that to stop! I still have a busy life away from it and many things still to do , but I consider myself one lucky person. So on to the details, as you know I have been playing with some new goodies from hubbie, well from Decoart actually , but you know what I mean... and here I have played with them some more and love this yummy crackle paste....coupled with some of my favourite distress colours...so the details.. 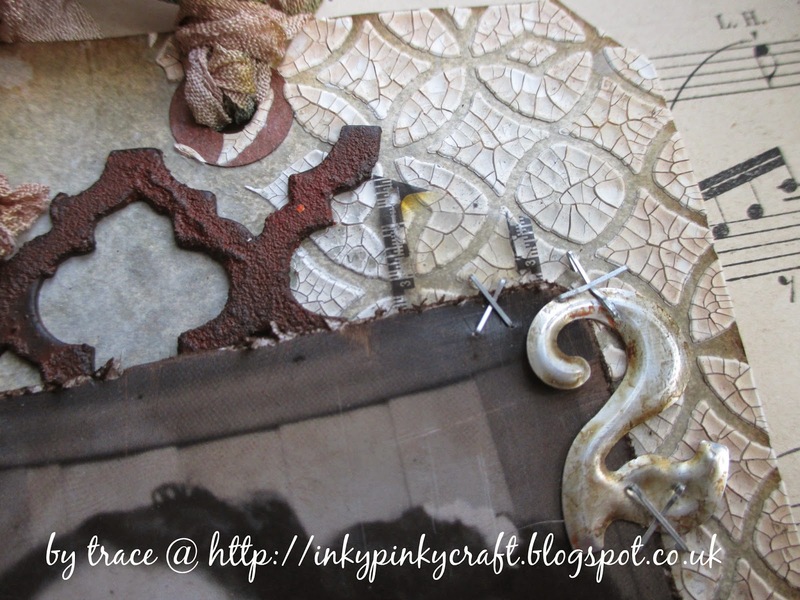 I started with a size 10 tag and applied Decoart crackle paste through the lattice Tim Holtz layering stencl, one of my favourites...and left it to work its magic. When done , I spritzed some pumice stone and frayed burlap distress stain sprays onto the tag and dried. I edged with some walnut stain distress ink. The spritzed some water into the palm of my hand and flicked across tag, leaving for a few seconds before dabbing off and heat drying. I love these colours and that crackle is just yummy, don't you think? Now to add some details, I created some rusty looking pieces using trellis frameworks die and a technique from Andy Skinner's Timeworn course ( so no details but you can find the course here ). I like to place things and leave them unstuck until I have finished as I often move stuff about! Now for one of my favourite ideaology releases, okay I have a few ..well maybe more than a few but i love these found relative cards and this one just wanted to be used, I lightly sanded it and inked with...you've guessed it, walnut stain distress ink, scuffing the edges with my edge distressing tool. I added a numeral, which had some Decoart painty distressing ...and was stapled with little kisses! Finally I added some trusty rusty wire, a word band and some hand made flowers, again given a Decoart painty finish. The flowers were die cut, embossed using Tim Holtz embossing folder, I then added some washes of decoart paints before adding a layer of crackle glaze. when dry I covered in antiquing cream and rubbed off, leaving very subtle highlights in the cracks. 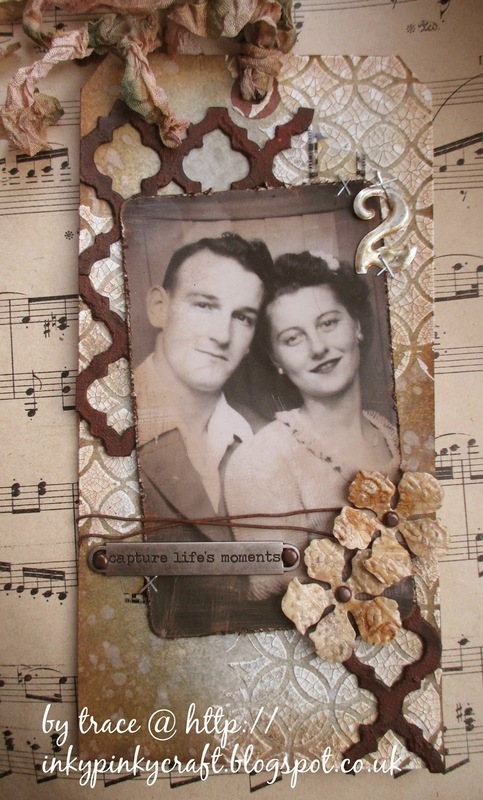 So there you have it , the results of some very happy playtime, rediscovery of my love of distress and all things Tim Holtz and also a new discovery of a love of Decoart....I love how I can combine these with my love of vintage and that I am that I learning new things! I think I might like this painty lark! Armed with some new DecoArt goodies thanks to my lovely hubbie...I set too, to just play..and here is the first piece finished..be gentle! I then added colour over the whole piece... and built up the layers of colour using a brush and also rubbing some of the colour on using my fingertip.... I used blue green light, cobalt turquoise hue and cobalt teal hue. Then some quinacridone gold, all from DecoArt media line . Just love the crackle , yummy! I love the smudgy feel of applying some of the layers of paint with my fingertip , rather than a brush.. So here are some close ups of the finished piece... I used a technique from Andy Skinner's Timeworn course...so cannot divulge the details but details of the course can be found here. For some of the idea-ology and die cuts I dry brushed some additional paint over them. Here is the difference in the finish of the cogs... I used a splatter brush over the background to splatter paint across the background.. and aged the word band using some paint rubbed across using my fingertip. Here is a close up of the stippled texture of the modelling paste which..I so want to play with some more...and this piece was all about playing and experimenting.. I used some of Brett Weldele's stamps and felt this ship's captain and the tentacles fitted the background colours... I coloured the images using distress markers. Anyway, thanks for stopping by...I hope you like the first results of my playtime!